How did Edgar Allan Poe really die? Edgar Allan Poe's lifeless body has been found in a gutter, yet signs of the reclusive writer have been found all over Baltimore. A team of muckraking journalists sift through the clues to find out what happened to him. WASHINGTON — Edgar Allan Poe’s lifeless body has been found in a gutter, yet signs of the reclusive writer surface all over Baltimore. A team of muckraking journalists sift through the clues to find out what happened to him. Welcome to “A Dream Within a Dream,” an “immersive, transmedia production” that invites audience members to become part of the plot. “We turn the story on its head,” says co-writer, director and producer Nasreen Alkhateeb. There is no stage and there are no seats. Instead, audience members walk through different scenes from Poe’s collection and meet a cast of twisted and tragic characters. Each vignette in “A Dream Within a Dream” offers a clue as to how Poe might have died. Was he killed by a rival writer or a jealous lover? History has never quite answered that question. Poe died in 1849 in Baltimore’s Washington College Hospital after having disappeared for several days. Theories about the exact cause of death include excessive drinking, rabies, heart failure and murder. But details of his final days remain sketchy at best, and Poe’s death will remain one of literature’s greatest unsolved mysteries. “A Dream Within a Dream,” titled after a poem of the same name, uses that as its premise to immerse the audience in Poe’s macabre world. First we meet Virginia Clemm, Poe’s young cousin and wife who died from tuberculosis, a disease that also claimed Poe’s mother, brother and foster mother. Virginia’s haunting presence is the first hint that this world plays by its own rules, similar to the production itself. Alkhateeb says she and her co-creators were influenced by immersive theater, or promenade theater, which was big in the 1960s and is making a comeback. In this type of storytelling, location is key. The set could be a hotel or courtyard, which is transformed to become a character within the play. “A Dream Within a Dream” takes place in an empty building on New York Avenue, in Northwest D.C. The front window is converted to look like the headquarters of a newspaper called “The Union Stylus.” Theatergoers are taken up several flights of stairs into a warehouse room filled with characters from Poe’s imagination, each corner coming to life with some twisted scene of external torture or internal torment. “It’s more like an installation than it is a sit-down, audience-stays-quiet type of experience,” Alkhateeb says. You don’t need a working knowledge of Poe’s literary canon to enjoy the show, though some background could prove helpful, if only to lessen the shock of some of the scenes (“The Fall of the House of Usher” is especially creepy). 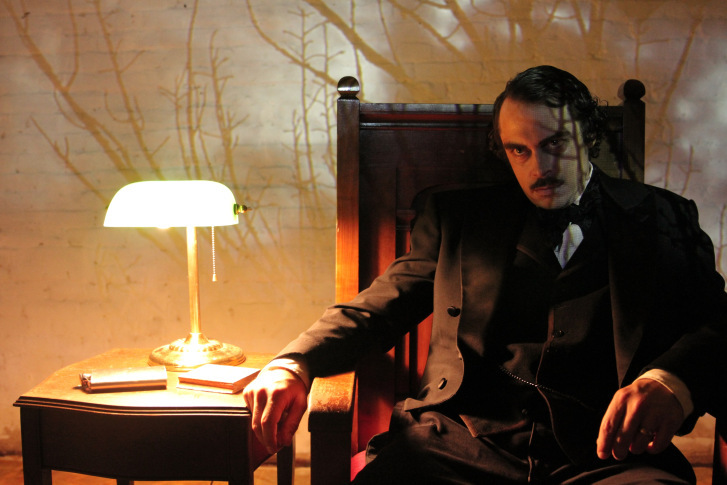 Actor Ian Rogers brings Poe to life in a manic, almost obsessive way. We meet the writer as a ghost, still mourning the loss of his dear Virginia and unable to cope with the grief left in her stead. Rogers says he didn’t dive into Poe’s biography, but let the script guide his portrayal of the writer. Alkhateeb lists John Carpenter and Guillermo del Toro as some of her biggest inspirations. Their influences are clear in certain aspects of the production — especially makeup and set design — but the show is suitable to younger audiences as well. “A Dream Within a Dream” is co-created, co-produced and co-directed by Alkhateeb, Jennifer Schwed, Christina Helm and Doug Bradshaw. Bradshaw is also the main writer. Fans of the macabre can see the play as part of Capital Fringe Festival, which runs through July 27 at various locations in D.C. Click here for showtimes and ticket information.